There was only orange juice in the fridge. Nothing else that you could put on cereal, unless you think that ketchup or mayonnaise or pickle juice would be nice on your Toastios, which I do not, and neither did my little sister, although she has eaten some pretty weird things in her day, like mushrooms in chocolate. "No milk," said my sister. "'I bought the milk,' said my father. 'I walked out of the corner shop, and heard a noise like this: T h u m m t h u m m. I looked up and saw a huge silver disc hovering in the air above Marshall Road.' 'Hullo, I said to myself. 'That's not something you see every day. And then something odd happened. 'Find out just how odd things get in this hilarious story of time travel and breakfast cereal, expertly told by Newbery Medalist and bestselling author Neil Gaiman and illustrated by Skottie Young." This is one of the weirdest books I've read in a while. I'm just going to write a short review, since it took me a short time to read Fortunately, the Milk (actually probably like ten minutes in a bookstore). That said, it's a great little story, and it has wonderfully wacky illustrations, which could use a little more time if you've got it. 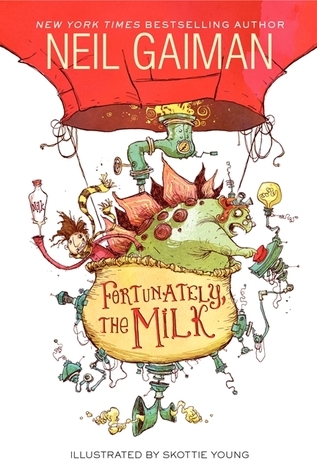 In true Gaiman style, a bottle (or rather, two bottles) of milk manage to save the world; fortunately, the father has the milk still in his pocket after a whole series of improbable adventures involving aliens who want to remodel the world, a dinosaur with a time machine, and more. And the need to fetch milk at the corner shop results in a wacky, wild adventure for the father to tell his kids, neither of whom really believe him. My immediate reaction after closing the book was "well, that was odd". I wasn't quite sure if I really liked it, but you gotta love Neil Gaiman. It's a great and funny children's book, although it must be said that without Skottie Young's absurd illustrations the book wouldn't be half as good. They're what makes the book come to life, and what makes the book decidedly un-stupid. Although still rather silly, it's a great little story, and probably deserves a bit more time than I took for it (who knows, I might buy a copy yet). The illustrations alone make it worthwhile; some of them are a bit disgusting, but they're certainly inventive, as illustrations for a story like this must be. Neil Gaiman is so creative though; most people couldn't make something so detailed from just a little scenario like this. There were some parts of the book that were just really original. I mean, who else would have thought of this? I can't imagine this book on a Kindle (or Nook); I'm sorry, I just can't. Fortunately, the Milk is the kind of book you want to have in your hands, able to feel the illustrations and the words (plus, the paper and jacket are really nice). It just wouldn't work. (I only thought of this because when I was looking up the first passage on Amazon only the Kindle preview was available). Anyway, Fortunately, the Milk was a great little book. I don't know where Gaiman comes up with this amazingly bizarre stuff.